I was reading and watching some of Jonah Lehrer's oeuvre, and found him a bright, engaging speaker in the mold of Malcom Gladwell. He presents research anecdotes like the one I blogged on below, and then suggests this has some profound implication. In some sense it is the Freakonomics method: find a 'funky' result studied by genius professors (did you know Steve Levitt is widely considered the greatest young economist? ), and note that it is totally outside the conventional paradigm. For example: Most people think they are above average drivers. They can not all be. They still all think so (me too!). This is irrational. Models built on rational expectations are wrong. This disproves the Black-Scholes model that caused the mortgage crisis. QED. I enjoy these stories as much as anyone, but notice that when they go into my domain they are 100x less interesting. Neural science, dark matter, animal phsychology all seem fine. When an expert or expertise seems really powerful everywhere but in the subject you know well, you should be skeptical. For example, here is the McGurk effect, and it is rather fascinating. Basically, if you see someone saying "fa" but they pronounce "ba", you will hear "fa". Your sight affects your hearing. Now, a skilled writer could probably present this as having some really important implication to finance or politics. It's interesting, true, slightly surprising because it's new to me, but not important. Important, new, and true are the hallmarks of Good Ideas. They are as rare as a good melody. One must watch out for authors who present new, important, and true ideas, but never at the same time applied to one idea. It's like the empty suit strategy of having strong opinions only on irrelevancies like sports or fashion, but then never taking a risk on real matters at work. People around you often won't think of you as indecisive, because you are such a strong Lakers fan, and you don't risk actually being wrong on something important to your business. GM supposedly sold stock today that implies a current p/e around 6.2 (earnings around $8B, market cap around $50B), compared to Ford at 8.3. I am confident GM will fail in the long run, but that's a long time from now. GM was a money loser for years, and when you considered their off-balance sheet liabilities, insolvent since the early 1990's. In June 2009 the equity owners were finally basically wiped out, and bond owners got about 15% of their principal. The new GM bought many of the assets and the trademark "General Motors" from the old company, has many of the same employees, and sells many of the same brands. Basically, it's the same company, just without all those pesky liabilities (debt went from $97B to $17B)! Looking above, you can see their 'official' Liabilities/Asset ratio was pretty stable around 0.90 for a decade prior to the financial crisis. With creative accounting, they looked viable, until the losses made this impossible. Currently, the liabilities/assets ratio is around 0.80, and this is a much 'cleaner' number because many of the overvalued assets were transferred to the US Treasury. Given Ford's Liab/Asset ratio is around 1.03, I'd say GM is a better buy for the same price-earnings ratio, meaning: buy GM/sell F.
Just don't put it in your kid's college fund into GM and forget about it. GM didn't die due to bad luck, their cost structure was and still is not competitive with the Japanese. In the same way that a spendthrift whose rich dad pays off his credit cards every so often has no incentive to become frugal, GM has no need to make hard decisions. 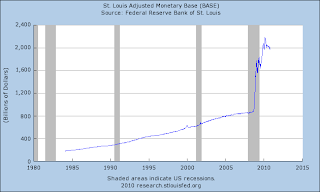 It will survive one, maybe two, recessions. The study began with 40 subjects blindly picking ping-pong balls from a hat. Half of the balls were labeled "rich," while the other half were labeled "poor." The rich subjects were immediately given $50, while the poor got nothing. Such is life: It's rarely fair. When people in the "rich" group were told that a poor stranger was given $20, their brains showed more reward activity than when they themselves were given an equivalent amount. In other words, they got extra pleasure from the gains of someone with less. If life's rewards were primarily arbitrary I agree that people would would be in favor of higher taxes. Success in life is a combination of luck, effort, and ability. One big difference between Conservatives and Liberals is the relative weighting they see on luck and effort in our lives. The Rawlsian Theory of Justice starts from the presumption that social status, intelligence, strength, even ambition, is exogenous, so rewards are all the luck of the draw. In that case, massive egalitarian redistribution would be preferred. The problem, as Robert Nozick pointed out, is that people have preferences, and willingly pay to watch star athletes, or buy specific products (iPads), which then skew the distribution of income. To take away the rewards to such people and products will mean these services and products do not exist, which is a worse state of affairs, as demonstrated by people's willingness to pay for these things in the initial state. Virtue and vice are basically defined by their statistical results to the actor, so these payoffs are not incidental but rather intrinsically related to what is called good and bad behavior. Nozick assumes effort is a function of reward; Rawls that painters, athletes, and inventors will be relatively unmoved by taxes and subsidies. People like fairness, but this means different things depending on how rewards are created. It is fair to redistribute random bounties, not fair to redistribute wealth that motivated its creation. While one might think that if they had a mechanism to distinguish the two and tax accordingly this would be an improvement, the fact is taxes and state fees are created via a collective mechanism that is more about fortifying coalitions via patronage jobs on the one end and barriers to entry on the other. Thus, it is fairer in the real world to minimize the state Leviathon so these truly arbitrary allocations are minimized. For example, I'm sure many unskilled workers would prefer to have jobs at the Post Office, but these positions are primarily distributed independent of ability and effort. In the most stunning solution of a "Wheel of Fortune" puzzle ever, a Manhattan editor Caitlin Burke nailed a staggeringly long answer with just one letter for a clue. 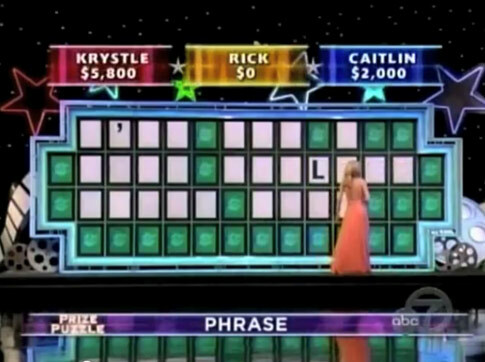 The show has you spin a wheel that generates prizes for each letter guessed, and usually you wait until the phrase is mostly done, such as "Risky Stocks are Crappy Passive In-estments". 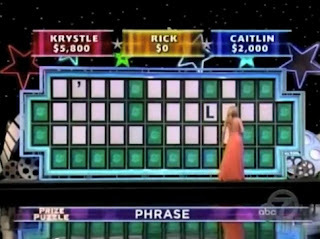 But when she was staring at the highly ambiguous 27-letter phrase "-'-- --- - ---- ---L--- ----- ----", she risked her chance at winning by guessing: "I've Got a Good Feeling About This". She won a Caribbean vacation worth about $6,500 with that guess. She finished the game with a total of $53,618. This seemed like some kind of joke, or the game was rigged, but it seems legitimate. Learning about how she did it is interesting. First, she played the game at home a lot with her family, and was relatively good at it. This is also evidenced by her total winnings, which show she did not merely get lucky. Second, she identified the "-'--" as "I've", because that is the most common three letter contraction that starts a sentence. Lastly, her ringtone for her boyfriend is "I've got a Feeling" by the Black Eyed Peas, so a close phrase was in her short term memory. Put that all together, and her guess seems reasonable, without that information, it seems like magic. I find that many theories are like that. If you look at the history and derivation of many models--Black-Scholes, special relativity, the law of gravitation--you'll find similar properties. What seems like magic is a pretty straightforward synthesis of some well-known information, applied by someone who is smart but not superhuman. BTW, when Oliver Wendell Holmes made that statement (it's been attributed to others, but whatever), the federal government was less than half of what it is now as a percent of GDP. Is there a point at government spending is sufficient? Or is it, as long as one rich non-governmental worker exists, the government should be spending it as the cost of civilization? One supposed silver lining of totalitarianism is that they make the trains run on time. That is, they are efficient. As Galbraith used to say, the Soviets never had involuntary unemployment! After the fall of the Iron Curtain and the revision of GDP data, this is rarely uttered much anymore. Historians have uncovered evidence leading to the estimation that the Nazis' wartime confiscation of wealth from Europe's Jews financed about 30 percent of the expenditure of the German armed forces during WWII. The official study of the German Finance Ministry under the Nazis from 1933 to 1945 was conducted by historian Hans-Peter Ullmann. Proto-Keynesian socialist economist Joan Robinson wrote that "Hitler found a cure against unemployment before Keynes was finished explaining it." If you leave out the parts about killing all the Jews and invading Poland, what specifically about the Nazi political platform do you disagree with? I can honestly say 'almost all of it'. Most modern liberals can't. update: Jonah Goldberg wrote the book Liberal Fascism where he makes this point. For the record: he does not admire Nazis and neither do I. I suppose as an american of German heritage I should be more explicit about that, because on the internet it's easy to misinterpret points that aren't super straightforward (As Harrison Ford said in Indiana Jones and the Last Crusade: "Nazis. I hate these guys."). Goldberg points out that other than their militaristic imperialism and racism, much of their policy is pretty consistent with modern liberal and progressive politics. The road to serfdom starts by giving the state a lot of power. important parts of modern macro are about understanding a large and interesting suite of asset pricing puzzles, brought to us by Hansen and Singleton and their followers—puzzles about empirical failures of simple versions of efficient markets theories. Here I have in mind papers on the “equity premium puzzle,” the “risk-free rate puzzle,” the “Backus-Smith” puzzle, and on and on. The only real progress I've seen on the equity risk premium is noting it is not nearly as large as initially thought (down from 6.9% to 3.5% by most economists). 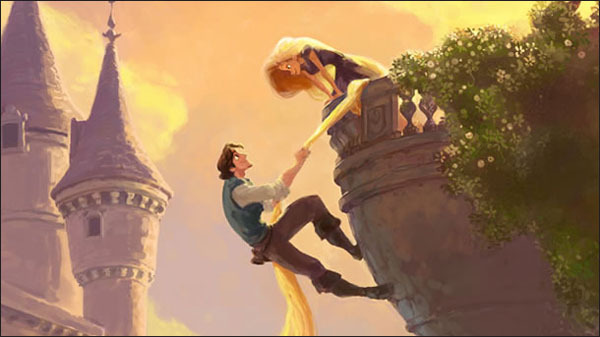 The theoretical explanations have generally focused on fat tails. This was first proposed as a solution to the equity risk premium by Thomas Rietz in 1988, and later extended by people like Gabaix, Wietzman, and Barro. But they have as their basic problem their solutions generalize and the 'equity risk premium' does not: any of these solutions creates more puzzles than it solves. If this is exhibit A for Sargent, it's clearly bad news for Macro. The Backus-Smith puzzle relates to how 'real exchange rates' and consumption are not correlated like they 'should be', and the 'risk free rate' puzzle is why are interest rates so low? Since when has creating puzzles been the main point of science? Sure, puzzles are interesting when they are like condiments on your hot dog, but when ketchup is your main meal it's no longer appreciated. While the big things are unanswered (eg, why is Mexico poorer than the USA? What causes business cycles? ), the last thing we need are more puzzles. My favorite characteristics of a healthy science are the old fashion ideas like 'explaining more with less', 'estimating important relationships more precisely', or 'predicting out of sample'. Rolnick: I’ll come back to that in a second, but you haven’t said anything yet about what is to be gained in terms of understanding financial crises from importing insights of behavioral economics into macroeconomics. Rolnick: please elaborate further on macro scholarship and financial crises. Sargent: I like to think about two polar models of bank crises and what government lender-of-last-resort and deposit insurance do to arrest them or promote them. Both models had origins in papers written at the Federal Reserve Bank of Minneapolis, one authored by John Kareken and Neil Wallace in 1978 and the other by John Bryant in 1980, then extended by Diamond and Dybvig in 1983.9 I call them polar models because in the Diamond-Dybvig and Bryant model, deposit insurance is purely a good thing, hile in the Kareken and Wallace model, it is purely bad. These differences occur because of what the two models include and what they omit. So, of those two models, the Kareken- Wallace model makes you very cautious about lender-of-last-resort facilities and very sensitive to the risk-taking activities of banks. The Diamond-Dybvig and Bryant model makes you very sensitive to runs and very optimistic about the ability of insurance to cure them. Both models leave something out, and I think in the real world we’re in a situation where we have to worry about runs and we also have to worry about moral hazard. As you know, an mportant theme of research for macroeconomics in general and at the Minneapolis Fed in particular has been about how to strike a good balance. So, they have these great models for two unrealistic cases with opposite implications, and reality is somewhere in between. Unless one can be a little more specific about how to split the difference, I do not see how this framework helps. It's like saying, government spending is beneficial if there is no crowding out of investment, wasteful if there is complete crowding out, and the answer is in the middle. Everything, alas, is an empirical issue, and we don't have enough data. Sargent's best paper in my opinion is his 'Some Unpleasant Monetarist Arithmetic', which used mere algebra to show a scenario where budget deficits imply a trade-off between some inflation now or more inflation later. I think it will be his signature economic insight. 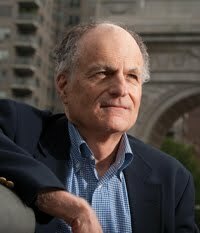 Sargent was one of the those macroeconomists who made the bad inference that since some rigor is good, rigor is not just better, but the very essence of science, and the implications of all these highly parochial, unreal models would manifest itself like a Seurat painting seen from a distance. This was just a really bad idea, one that Frederich Hayek warned about but no one listened too. Smart people can be very clueless when they apply too much precision to imprecise problems. I got a copy of the latest big book on the crisis: All the Devil's are Here, by Bethany McLean and Joe Nocera. The bottom line: this train wreck was inevitable. 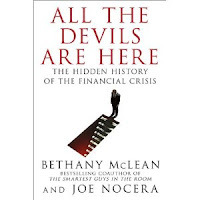 This book focuses on how mortgage lenders, rating agencies, investment banks, regulators and government agencies started down the primrose path to the final mortgage madness in early 2007. Most persons and institutions come off as petty, clueless or short-sighted, with ulterior motives masked by some public spiritness (‘financing the American Dream’). Many were clearly mistaken as geniuses during a long bull market (eg, CountryWide’s Angelo Mozillo won the American Banker's Lifetime Achievement Award in 2006). While the book tries to focus on a handful of leaders like heads of Fannie Mae, Ameriquest, Merril Lynch and others, I got the feeling none of these people were really necessary. As the authors note, well-known financial titans like O'Neal and Mozillo were not very hands on. The authors also mention Blythe Masters of JPMorgan, another Dilbertesque manager who really does not understand the products she is officially in charge of any more than Obama understands any of the myriad large institutions he officially 'runs'. Even ignoring this, the book makes it clear that everyone was ultimately chasing profits, trying to gain or just maintain market share. The prime mover was house prices. Given this upward trend the excesses are like detailing salacious happenings at a frat party: given a bunch of unsupervised young people and lots of alcohol the specifics are both irrelevant and inevitable. Fannie and Freddie, the big Government Sponsored Entities (GSEs) come in as a real powerhouses. The book notes an employee there saying "the same people who had power over you, whether they were congressional staffers or HUD employees or even members of Congress, wanted jobs and would unabashedly seek them." It was pretty clear that the regulators of Fannie and Freddie were puppets of the legislators who relied on the GSE perks, (Fannie spent $170 M on lobbying in the decade ending 2006). When legislators were about to rule on the GSEs they would get a "Fannie pack", which consists of every single loan originated in their district over the past 5 years. Republicans and Democrats loved this agency. But the lobbying and legislative rot ran deep and broad. Current Massachusetts governor Deval Patrick was hired as an Ameriquest Board member and received $360k per year for this 'job'. Yet, it paid off when he stepped in to help his old pal by placing a call to Robert Rubin, getting Citigroup to inject capital into Ameriquest in 2007, and he made some fruitful calls to Obama on behalf of Ameriquest's CEO as well. An interesting note is that some players did notice things were amiss in real time. In 2005, Greg Lipmann noted vastly higher default rates when home prices 'only slightly' as opposed to in 'double digits', highlighting that unsustainable price appreciations were necessary to prevent a collapse in these mortgages. Andy Redleaf noted that in one presentation 85% of the mortgages were to take money out of a house ('cash-outs'), as opposed to buying a house. When he asked the company executive if these had different loss rates, the exec said he did not know, but presumed they were the same. This presumption, Redlief knew, was not innocuous, and supposing it so implied a massive amount of wishful thinking. These are the kind of signals that are interesting, because they highlight how one could have seen this all coming in real-time. Redleaf notes that it was not a handful of people who saw this coming--the theme of Michael Lewis, a great writer who is more often than not completely wrong on his main them--rather, there were about 50 hedge funds he knew of trying to short this stuff in 2006. Now, I was not close to these asset classes, so when things fell apart in 2007, I had no idea that teaser-rate ARMs had grown from 31% to 70% over the prior 8 years, or that no-documentation loans were up from nothing to 30% by 2006. Those kind of statistics were not highlighted in real time. Worse, loan originators appear to have been on a mission that could have only ended with massive failure. For example, one firm had to come up with a policy when silly loan applicants supplied information that was unnecessary under their ‘no doc’ lending program. The extra information actually made it harder to qualify, so they found a sneaky way to erase such information (eg, documentation of insufficient income). By 2006, loan standards were basically nonexistent and such a scenario was not going to end well. The book notes that synthetic CDOs are basically futures bets: zero-sum transactions. They do not bring in capital, they merely provide more prices, more markets. The authors suggest that the synthetic CDOs facilitated more lending, because investment banks could then hedge exposure they would not have taken. I’m skeptical that adding prices, and zero net capital, fueled the boom. Further, these markets really only grew in the final year and this catastrophe was decades in the making. 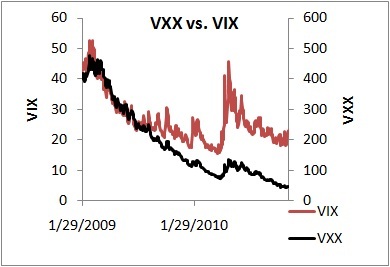 Finally, the ABX index was one of the first mortgages prices to tank, and peremptorily shut down the mortgage secondary market by the end of the first quarter 2007, well before most banks shut off their lending programs (our US government is the only party unmoved by recent experience, dominating loans for under $300k). Value-at-Risk is mentioned as if this had relevance, but I don't see how. VAR is a way to measure risk and subject to 'garbage in-garbage out'. The garbage in was the assumption that home prices, nationally, would not decline. Given that assumption, there is little risk. This isn't abstruse math, it's something my stupidest relative would understand. It is not, nor has it ever been, applicable to an entire firm including many held to maturity portfolios (ie, portfolios without market prices). I worked with VAR when it first came out, and we applied it at KeyCorp, to about 1% of our equity risk capital. For investment banks this number is higher, but it’s still small, hardly the sorcerer’s apprentice-type tool that had any effect. 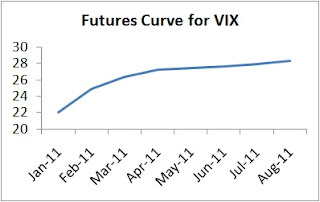 So the real question is why everyone thought the market would always go up under this madness. Several times there is a suggestion that a few regulators were thwarted in their attempts to control the market--Shiela Blaire at the FDIC, Brooksley Born at CFTC--but there's no evidence that any of their little attempts to gain more regulatory control would have mattered. First, they often had only vague objectives to ‘look at’ various questions, or have the CFTC monitor something instead of the OTS. Secondly, its not as if synthetic CDOs traded on an exchange would have necessarily prevented this problem. Lastly, it is not as if firms regulated by the OFHEO, OTS, OCC, the Fed, had significantly different behavior. Lending to people who could not afford it served many objectives and had many constituencies, and so the bottom line, that underwriting criteria weakened more and more until the end when underwriting criteria basically did not exist. The key was, given the top-down directive towards increasing home ownership, especially among the poor, this implied weaker lending standards. While later they claimed 'no one made banks lend to people who could not pay', while technically true, it was also true that regulators did nothing to discourage such lending and plenty to encourage it. 'Not force' does not imply 'discourage'. The criticism of the rating agencies I found rather funny. They note as a critique there were 'many instances when [the rating agencies] got it wrong, usually when something unexpected happened.' Did they expect the rating agencies to predict these unexpected events? Let me know when you figure that out. To recap, rating agencies generally give the market a slightly independent view of 'quality' that is also highly informed by the market. If something trades in the market at prices consistent with a B rating, it will not have a AAA rating, and vice versa. Rating agencies do not differ from the markets for very long. However, they also do not simply ape the markets, which is why they lag them. If you think ratings are 'totally wrong', then it should be pretty easy to create arbitrage in credit markets because prices and ratings are generally consistent, and this is not so easy. However, it would be folly to defer one's credit analysis to the rating agencies if you have, say, over $100MM to invest. Like everyone else presented, the rating agencies were drinking the ‘home lending’ Kool Aid. Borrowers are treated as victims, gouged by lenders, who then get expropriated somehow, as if the homes bought with fraudulent statements, teaser interest rates, and no money down, was something they truly owned. The authors note 'these mortgages weren't bought, they were sold'. No, they were bought too. This only worked because borrowers were getting cheap if not free options on home prices, and these options paid off handsomely in the decade prior to 2008. They enjoyed cashing money out of homes throughout the housing bubble, and those stories facilitated more willing victims who were just as greedy and short-sighted as investors. The under capitalized home owner lost less capital than anyone in this fiasco, so I don't see them as the 'losers' in this game. The key to a bubble is the broad asset class trend that facilitates it. This highlights why interviews on CNBC are so clichéd and vapid. I mean, really successful people seem nice enough, usually have virtues like discipline, good humor, and above average intelligence, but once they stop talking about their childhood (who didn't have interesting challenges growing up? ), their big idea is often just to go all-in on a big trend that works. A really big bet like that that pays off can't be luck, many people think, because that would be an absurd amount of risk. This just highlights the maxim about confusing a genius with a bull market. It happens all the time. 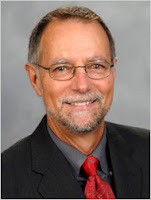 Tadas Viskanta runs a blog called Abnormal Returns, and he interviewed me on his show. The video is within a site called StockTwits, which is actually a take on 'stock twitterers', not a comment on the speaker's competence. He talks weekly with various investment people, and I was happy to be on. We mainly talked about risk premiums. Because of technical issues I could only hear Tadas, and was looking at a screen with a 1 cm box that showed if my head was in camera. There was often feedback I heard that does not come out, and it screwed up my thoughts because I kept thinking this would all be scrapped. I talk about my Beta1.0 strategy, and how I'm giving it out...actually, I have a patent pending on it as well. I did this prior to publishing Finding Alpha. However, if it is successful, it would only cover the US, and the whole thing is an out-of-the-money option. And no, I don't think I'm Einstein, I was just making an analogy of aether to the risk factors, and any implication I think I fixed this the way general relativity fixed aether, is clearly silly. At Obama's press conference, Obama used 'I' instead of 'we' a lot. As part of a narcissistic profession his narcissism stands out, but I guess to run for President on his resume that's a given. Obama also talked about paying more attention to process, Jon Stewart's main complaint when Obama visited his comedy show last week (Comedians running the country? It would be an improvement!). Nobody cares about this stuff — they care about results. Nobody really cares about earmarks; they’re just code for spending less (less on somebody else, of course, not me). Nobody cares about civility and bipartisanship, which in practice are code for Democrats giving in to Republican demands. Lenin reduced the past and future alike to two pronouns and a question mark: "Who—whom?" No verb was necessary. It meant 'who prevails over whom?' Everything is always about power, in the past and in the future. Krugman dismisses the 'how'--institutions, incentives, and all other means to an end and focuses on what--for him, matters: who gets what, and who pays what. Krugman's dismissal of means over ends explains why he's unconcerned about deficits and taxes because those are means to his end, which is egalitarian redistribution managed by an all-powerful (but smart and good) state. The serenity prayer highlights it is important to do what works, not merely try to do what one wants. Countless times in the past people have expropriated the rich to spread power to the more numerous poor (Russians and Kulaks, Turkey and Armenians, Jewish expropriations throughout history). This has not been a productive strategy because prosperity and liberty comes from having strong property rights, which includes letting people keep their income and property. You can't get the end 'prosperity and liberty' directly, you merely can merely create conditions where this is maximized. Suggesting the President avoid civility and issues around 'process' is like suggesting one ignore indirect effects. It's what differentiates an economist, even a liberal economist, from a radical adolescent muckraker. I guess this highlights Lord Acton's dictum that power corrupts, and so like Smeagol to Gollum, his popularity and power have turned him from a thoughtful person to a dogmatic liberal shill for more government. The Federal Reserve will probably begin a new round of unconventional monetary easing this week by announcing a plan to buy at least $500 billion of long-term securities, according to economists surveyed by Bloomberg News. Not only is this destabilizing, increasing the monetary base even more than it has been, but the Fed is now trying to fine tune the yield curve. Bernanke's praise of Friedman's work, which promoted stable monetary growth rates, remind me of Marx (Groucho, not Karl): "those are my principles. If you don't like them, I have others." 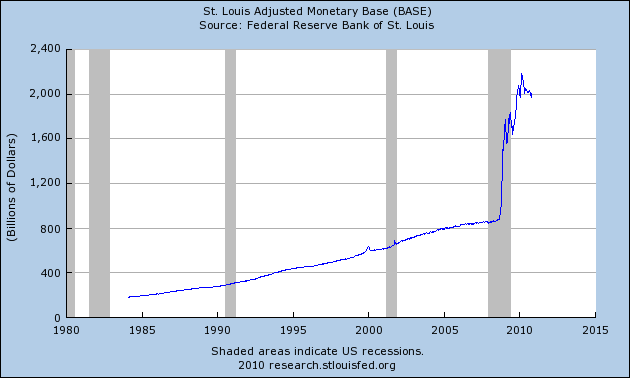 Here's the monetary base, the only monetary aggregate the Fed has direct control over. We are in uncharted waters. The key to the dominance of low volatility equities is that high volatility stocks are bad investments on the two main dimensions of stockworthiness: volatility and return. Volatile stocks by definition have high volatility, and also high correlation with the overall market (CAPM beta) and the business cycle. They all have below average returns. So why do so many people like them? Overconfidence: An investor who thinks they are smarter than others will apply this superior stock picking to stocks with the greatest upside. If you can identify those stocks with higher returns, this is better applied to Google and Apple as opposed to Coke and GE. Investor flows to Fund Performance: Sirri and Tufano (1993) documented that mutual fund inflows are convex: increasing in relative performance, and then turning upward strongly for the top performers. This generates a ‘call return’ payoff, so that the higher the volatility of the fund the higher the expected return to the fund manager. Winner’s Curse: Ed Miller (1977) showed that if investors invest in stocks they think are going to have high returns, stocks with greater variance in their expected return will have a winner’s curse to them, in that those with the higher variance will have owners with greater return expectations. This mechanism needs a short selling constraint, but most people will accept that. Information Costs: Stocks with higher volatility generate more news than less volatile firms. Such stocks are then ‘in play’, and so become relevant to the investor interested in deviating from the index. Given short constraints or overconfidence, this increased focus on volatile stocks leads to lower future returns. Alpha discovery: Many people believe they have an ability to pick stocks successfully. In order to demonstrate this ability to themselves they have to actually try this. It may all be luck, but if people believe that their short run performance signals alpha, that information would be considered valuable regardless. This biases investors towards the more volatile assets so they can assess their investing alpha more clearly. Lottery preferences: Friedman and Savage (1948) discussed the paradox that people liked lotteries where payoffs are 100+ to 1 though the expected return is negative, but were also generally variance averse. The popularity of lotteries continues, and suggests a deep preference towards positive skew. 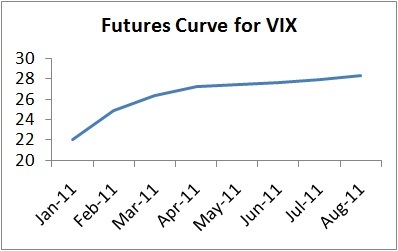 Journal of Finance editor Cam Harvey thinks that this explains many anomalies. Representativeness Bias: This is from Kahneman, Tversky, and Slovac (1984). The idea is base rate information is neglected in a Bayesian sense relative to the ease to which some anecdotes are presented. So, new listings are potential Microsofts or Googles in spite of their poor base rate, because most investors ignore or are unaware of base rates, and focus on the anecdotes. 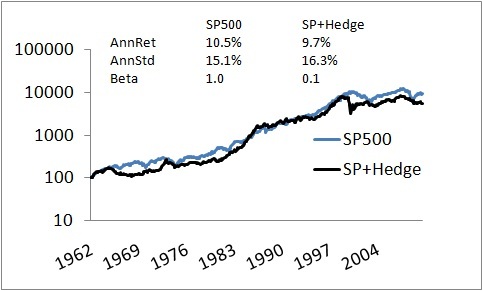 Highly volatile stocks generate a lot of favorable anecdotes. Signaling: If one is starting out in investing, the top investment managers generate a disproportionate share of attention from outside investors. To get into the Bloomberg’s list of top portfolio managers, you need a home run, a ’10 bagger’ in Peter Lynch’s term, something that can generate an outsized return that will generate to future investors or bosses that one is an investor with ‘alpha’. 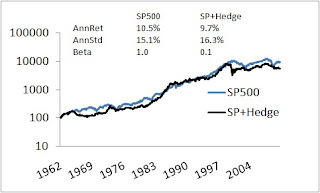 If you can outperform the indices by 2 percent a year but without any really great years that stand out, standard tracking error implies your customers will need a lifetime to discern your alpha, so you might not even bother unless you have really good connections. So, when all of those extra incentives to invest in highly volatile companies goes away, then we’ll have to re-evaluate the proposition. In the meantime, avoid these stocks if you can.